﻿ H.G. de Wolff - Éthique économique"
After so many reviews of Dutch, German and English books it is now time to introduce a French publication1. The French science has an impressive tradition in the social sciences. Auguste Comte is ranked among the founders of the sociology. Among the present celebrities are Emile Durkheim, Marcel Mauss, Pierre Bourdieu, Michel Foucault and Jean François Lyotard2. They are active in the broad field of philosophy, sociology, psychology and anthropology. Their attitude towards economics varies from neutral to critical. In this way they present an alternative view, which is worth studying. The book Éthique économique by François-Régis Mahieu fits excellently in this tradition, and it is merely one example from the enormous French supply of such publications. The specific work is not a pioneer, but yet it displays a certain originality. The preference of Mahieu for mathematical models is striking. Besides, his arguments manage to connect the sociology and economics, or at least to indicate where the two clash. And finally it is interesting to see how Mahieu couples the scientific debate to his involvement in the former French colonies in Africa. In this type of books the recurring question is how exactly the human nature can be characterized. In economics the starting point is the homo oeconomicus, who tries to meet his needs by means of a rational behaviour. But even within economics there is a discussion about the extent, in which the homo oeconomicus takes into account his own ethics and morals. A related question is the willingness of economic subjects to forgo the gratification of their own needs in an altruistic manner, for the benefit of others. Mahieu regrets in particular, that the insights of the anthropology do not pervade economics. The anthropology is unmistakably ethical and requires reflection. She asks the question: "Who am I?" Therefore the anthropology is notably interesting at the micro-economic level. Mahieu stresses on several occasions, that the individual represents both the universality and the otherness. The institutionalists (mainly Thorstein Veblen) and the Austrian School have tried to bring the anthropology within economics, but this attempt has failed, according to Mahieu. The economic mainstream sticks to hedonism, utilitarism, and rationality. The present institutionalism (among others Ronald Coase) tries to integrate into the mainstream, and studies especially the friction phenomena of the market. On the other hand some evolutionary economists elaborate on the sociological approach of Schumpeter. Here Mahieu gives an interesting description of the various orientations, and mentions among others also the Historic School and even the philosophy of Kant. The present neoclassical paradigm is characterized by the assumption, that all types of satisfaction can mutually be substituted. She does not address the natural human rights and the duties, which are not exchangeable. The neoclassical paradigm wants to isolate the normative theory from the positive theory. This leads to a defective sense of reality. In economics there is no consensus about the nature of altruism. In general it is supposed that it is caused by egoistic motives. John Rawls builds his theory on the philosophy of Kant, and stresses the fairness and justice. The utilitarism becomes subjected to justice. Reason is more important than rationality. This implies that collective decisions are needed, which results in a theory of duties. For instance, the incomes are redistributed. In more general terms, the individuals must invest time and means in their moral duties3. The individual carries with him a rucksack, filed with his rights and duties. A special type of duty exists between the generations. This duty is dictated by social-cultural traditions. However, rights and duties are not exchanged on the market. Moreover, claims are vulnerable for manipulations. Thus under certain conditions the rights and duties of specific groups (for instance a generation) can become unbalanced. This disturbs the economic equilibrium. The crisis can only be overcome by a reflection of the individuals themselves. A hedonism without norms would be senseless, since humans act within group stuctures. The social and the individual utility are interwoven. When a group expands, the norms water down, so that the system becomes less efficient. This can be repaired by the establishment of a central leadership. The social choice is replaced by the public choice, because the latter has lower transaction costs. On the other hand the bureaucracy introduces its own problems, such as rent seeking behaviour. Mahieu presents several mathematical models. Thus he describes the mathematical principles of the social choice theory. The reader gets a fair impression, but the details are left out. Furthermore Mahieu uses the Edgeworth box in order to explain how individuals fulfil their duties. Besides he develops a deontic formalism in order to represent rights and duties. Unfortunately Mahieu hardly applies his models, so that they remain an excursion without purpose. 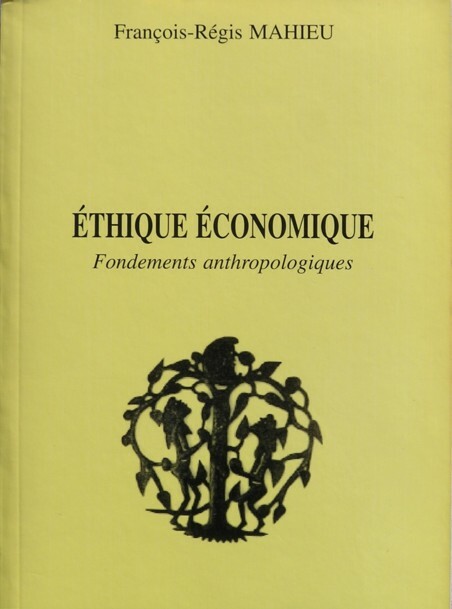 In the final chapter of Éthique économique Mahieu applies the previous arguments to the economic situation in the African states Ivory Coast and Burundi. In these states the informal economy is indispensable for the existential security. The free exchange has not yet become the dominant way of trading. The formal income is supplemented by other group members and by all kinds of secondary activities4. The culture in Ivory Coast imposes solidarity, which creates a capital flow from the cities to the countryside. The middle class takes care of the social redistribution. In Burundi the existence is guaranteed by all kinds of informal secondary jobs, such as brewing beer from bananas. The individual optimizes his available time over the various activities. The informal economy introduces flexibility and the capacity to adapt, and therefore is a social capital. She is active at the micro level. In general a central policy will lead to a sub-optimal result. The formal economy influences the informal economy in an unpredictable manner. So when the international institutions interfere, they must use an interpersonal approach. According to Mahieu the third world states are a convenient mirror for the western economies. The network is both a source of assets and of costs, so that the individual is engaged in a continuous search for the equilibrium. The economic personality is both calculating and moral. Your reviewer has read Éthique économique with pleasure and with a dictionary at hand. The book addresses many subjects, that are simply absent in the standard economic textbooks. A new world opens, and lots of original ideas are presented. Mahieu is a profound propagandist for the multidisciplinary approach. The other side of the picture is that the reader must have some knowledge about economics. And the contents is not really presented in a logical and pedagogical manner. In particular it would be clarifying to sum up the weaknesses of the neoclassical paradigm with more emphasis. Thus Éthique économique is not the final word, but an invitation to engage in a further and more profound study.